Wishing for a holly jolly Christmas? 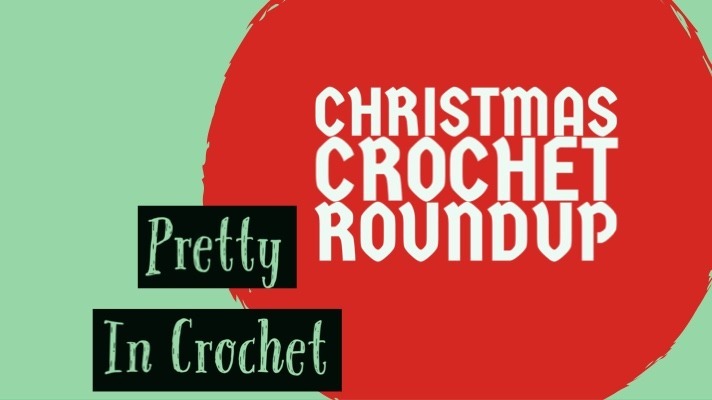 This Christmas crochet roundup is sure to get you into the spirit of the season, if you aren’t already wearing reindeer ears. 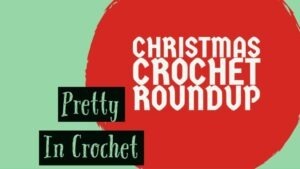 I’ve seen so many wonderful Christmas crochet patterns that I simply had to do a roundup to share with everyone. I doubt I’ll crochet a single one as I’m madly crocheting Christmas gifts, but I’m glad to have these patterns pinned. So let’s get right to this merry patterns, shall we? I really love this project. I found it on Nicki’s Homemade Crafts, a cute blog and It’s so cute and these trees will dress up your Christmas dinner table. 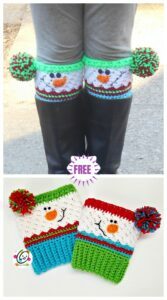 I’m sure it works quick up quick, and the blog has other cute Christmas crafts as well. The price is reasonable as well and this pattern has a good rating on Ravelry. This project is too cute! I love this little red nosed reindeer and I wish I had enough time to tackle this one. But I still have an finished amigurumi project in a bag somewhere that *will* one day get finished. But this might just be the project for you! This would make the perfect gift for a small child, or even just to adorn your fireplace mantle. 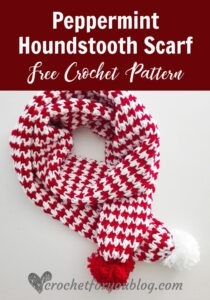 I found this free pattern at All About Patterns and I’ve bookmarked it to be hooked up. One day. I totally intend to make this make scarf. It might be a project I tackle before Christmas, if I can but this amazing scarf deserves hooking up. 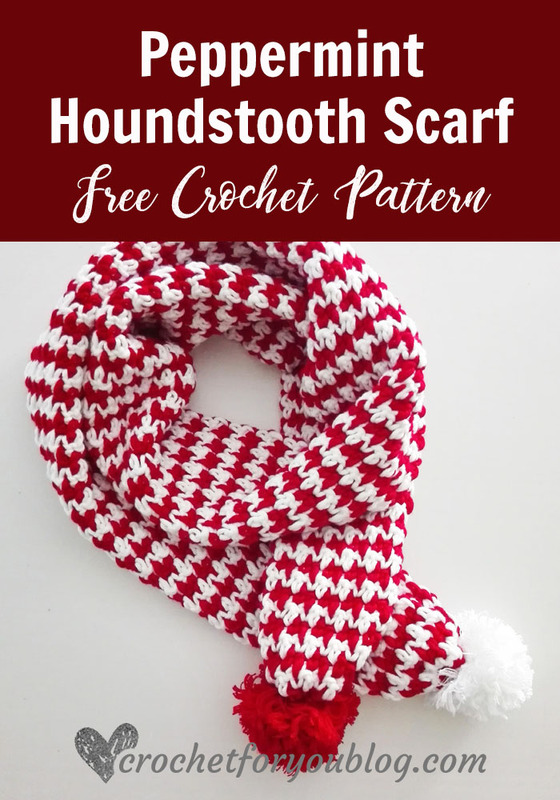 I found this great free pattern at Crochet For You, a cute blog and it has lots of photos and instructions to accompany this pattern. You should seriously check out this blog even if this project isn’t for you. IF you do want to hook this up, you find the pattern here. 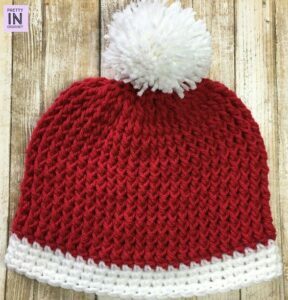 This is another fun pattern in my opinion, and I found it on Ravelry. These boots (which I originally thought were boot cuffs) are adorable socks that will show off the cute Christmas design once you slide on your boots! A really clever idea I think. Plus, they look warm and cozy. I think these would be so much fun to wear on Christmas morning, especially if they’ve just been received as a gift. This is shameless self promotion, I know, but this hat is super easy to make and you can find it right here on Pretty In Crochet! Plus, it’s free, which is always a bonus I know. This is the only Christmas pattern I’ve dreamed up yet, and I think it’s a pretty awesome one myself. I’ve worn this hat during the holidays and people did think it was super cute. Plus, you can always jazz this up with some holly embellishments or whatever suits your fancy. I really hope you love these patterns, and I would love to hear back from you–which is your favourite? Which one did is going to hang up on your hook? Please drop me a comment as I love interacting with you, and would love to do so more. Be sure to follow me on Instagram, Pinterest and Facebook too for more crochet love. That reindeer is just too cute!